Hello, Agrilinks reader! If you've clicked on this headline, you might be interested in becoming an Agrilinks writer by submitting a blog post to us. Submitting content to Agrilinks is a great way to share knowledge that will benefit others in the Feed the Future community. Below, you’ll find my top six tips for making your blog post more readable and more understandable. These guidelines are easy to implement, and will ensure that your blog post gets more eyes and more results! 1) Put the most important information first. Most people only read the first paragraph of a blog post, so make sure it stands alone. Assume it’s all someone will read, and write it accordingly. Your main point should be the first sentence in your blog post, not the last! Write in an “inverted pyramid” style. Basically, put the newsworthy stuff first, then provide more details. 2) Keep sentences short. Keep paragraphs short. An API study showed that articles with 8-word sentences (on average) had 100% comprehension. Those with 43-word sentences had less than 10% comprehension. Paragraphs should be 1-4 sentences, and should contain a single topic or concept. Varying the length of sentences improves readability, too. 3) Use bullet points, subheadings, and/or bolding to highlight key points. 79% of people scan blog posts, rather than read them word-for-word. Therefore, you need to give them visual cues for what to read. Read through your subheadings, bullet points, and bolded words and imagine that they are ALL the reader will see. Do they convey the desired message? 4) Provide actionable recommendations for the agricultural development audience. Readers shouldn’t just walk away from your post saying, “That’s nice.” They should learn something new that changes their behavior or way of thinking. Ask yourself, "What do I want my readers to do after reading my post?" Tell them! No blog post is complete without links. Link to the next post, paper, or site you want someone to read. Jargony, impersonal information is dry and hard to remember. Avoid it when possible. Don’t be afraid to use “I” and tell a story from your own perspective. Let your personality shine through! Should you throw in a question? Perhaps - they can focus readers’ attention. 6) Make the headline catchy! Puns and jokes aren’t necessary. Just use clear language to help the reader know what they’re about to see. BONUS TIP: Share your post far and wide! When authors share their own posts, the posts get many more views. So what do I want you to do? 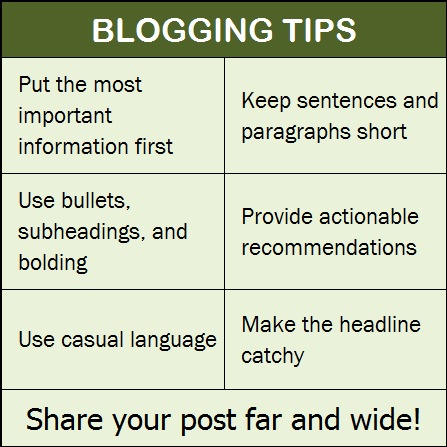 Keep this list handy, and next time you start writing a blog post, try to incorporate all six of these tips! The Agrilinks audience includes students, farmers, scientists, and seasoned development practitioners, among other diverse segments. But no matter how knowledgeable the reader, EVERYONE appreciates a simple, actionable, and enjoyable post. You can write one! For additional perspectives on blogging in the development sphere, check out this post by Duncan Green: What did I learn from a day with the UN's bloggers? Julie MacCartee is the USAID Activity Manager for the Agrilinks platform.